History/Legend of the Clan: The Ookami, sometimes called Ookami Amaterasu, were believed to descend from the sun goddess; Amaterasu. They were descendants that lived in the heavens for some time, before they took peace on the world known as Earth. The Ookami were originally the form of humans, to blend in with the other species on the world. Legends say that the death of Amaterasu caused the Ookami to completely split from the heavens, blocking them from ever going back. When the death had occurred, the world turned into chaos, wars broke out, and even the 9 Bijuu began fighting. Terrible storms hit, and lands spinned, causing many deaths. The villagers of a very small village known as Kamiki Village were sick of the crops dieing, and the constant storms. 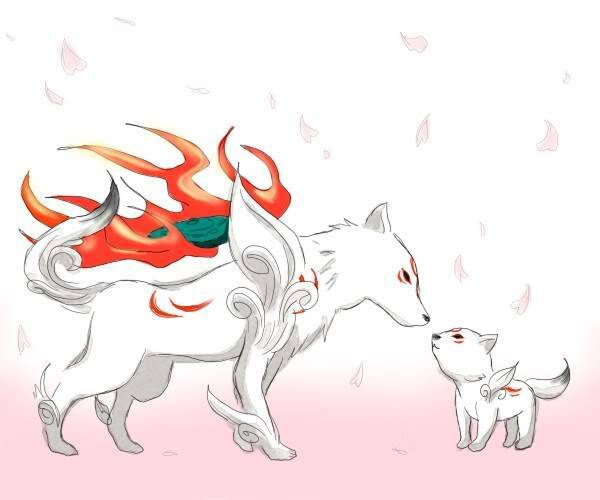 The villagers began performing weakly rituals, in an attempt to revive the sun god Amaterasu, though what they didn't know, was performing those rituals, was actually slowly turning the Ookami into more developed creatures, that were half wolf, half human. Some say that their Rituals failed, and some say that they were a success, though instead of physically reviving Amaterasu, they revived her inside of those she held closest to her. Ookami in this matter. It is said that a piece of Amaterasu lives within every Ookami member, due to their incredibly hot flames, and their powerful winds. Clan Powers and Summonings: Ookami have the ability to physically transform into what is known as the spiritual enlightenment, the foreseer of the heavens, the wolf of the winds, or even sometimes the fang of Amaterasu. At will, they can transform into the Ookami wolf, and revert back to normal as much as they'd like. The small wing like pieces on the shoulders of the beast, allows them to glide through the air while in that form at a young age, and fly, while using the wind element, when they are older. They have very fast speed, great eyesight, smell, and hearing. Younger Ookami members take the form on the right, while those who are older take the one on the left. When they grow older, the flame on their back never goes out, nor does it burn, or effect anyone they don't want it to effect. It is said to be a piece of Amaterasu's soul, which is the green stone like object gloating above their back. The soul is shrouded in a never ending flame. When they get older, this form gets more physical abilities, such as: extra wing like pieces around them, and the parts on their shoulder grows big. I feel it is Approved, though first is there any clan jutsu that uses the flame, or is it more like you can use the flame to attack enemies, if so how much damage does it do.